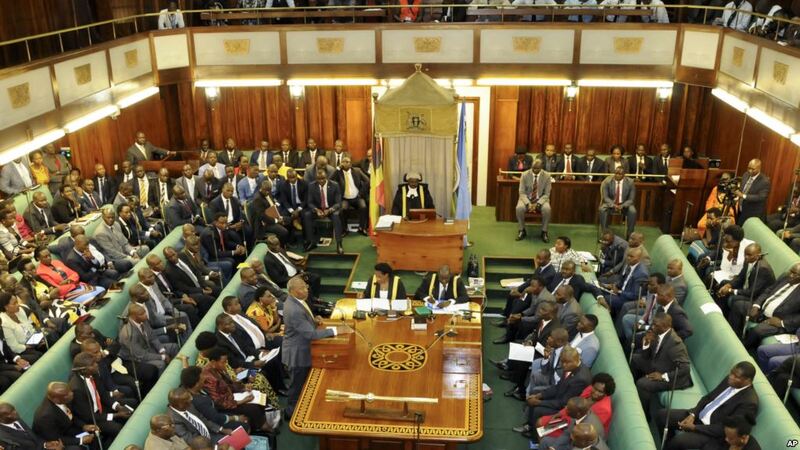 PARLIAMENT – In their recommendations to Parliament following months of investigation into sexual violence in learning institutions, the MPs on the Select Committee have called for the establishment of a database of all teachers guilty of commuting sexual violence against students. Taking to the floor of Parliament to reveal the Committee’s position was Robina Rwakoojo (Gomba West) told fellow Legislators that there is need by the Ministry of Education to maintain a database on teacher sexual offenders and should routinely publish names of teachers who are convicted by court dismissed from service or removed from the teachers register on grounds of sexual misconduct, to ensure that they do not re-enter the teaching profession after serving their sentences. The Committee’s decision was premised on their observation following the probe into cases of sexual violence where reports emerged that District Education Officers, were in the habit of simply transferring teachers accused and interdicted over sexual violence, without a full disciplinary hearing. Additionally, the Committee also found out that even in situations where the teacher is convicted by courts of law, he or she is not dismissed or struck off the register of teachers as required by law but is transferred to another school. The report pointed out a case in Rukungiri district of a pupil of Rukondo Primary School, who was defiled by a teacher and sentenced to 6 years in prison, a sentence he served and later released from prison and redeployed to another school in the same district. Like transferring is not enough, even when a teacher has been dismissed from one government school, for sexual violence, the dismissed teacher may still gain employment in a private school since there are no streamlined mechanisms for preventing the recruitment of sexually abusive teachers in private schools. In their recommendations, the Committee called on the Ministry of Education to take stern action against perpetrators of sexual violence in institutions of learning and should not merely transfer them to other institutions. “Teachers who are found guilty for sexual misconduct should have their teaching licenses revoked and their names struck off the register of teachers,” said Rwakoojo. The Committee also informed Parliament of the challenge to ascertain the actual conviction rates of perpetrators after discovering that the Directorate of Public Prosecution (DPP) does not maintain disaggregated data of the cases of sexual violence arising from institutions of learning. Yet still, several cases have been withdrawn or dismissed by court due to insufficient evidence arising from poor quality investigations and late reporting by victims. Additionally, the Committee noted that parents of victims, and victims, often collude with perpetrators to withdraw from the criminal proceedings and settle cases out of court, in exchange for money or in the hope that the perpetrator will marry the victim. The Committee was also told that some parents even go to great length to conceal birth certificates of their children in defilement and early marriage cases, with the intention of shielding perpetrators from the law. yet, besides birth certificates, the country lacks scientific means of proving the age of the victim. “This has frustrated prosecution of several cases since the success of defilement cases depends on proof of age of a victim,” Rwakoojo said. This challenge was mainly cited in the districts of; Ntoroko, Bundibugyo, Bunyangabu, Mbarara and Nakaseke where cases of early marriages are rampant. In such situations, the DPP is forced to withdraw the case leaving the perpetrator to go scot free. The Committee further established that some Resident State Attorneys are complicit in handling cases of sexual violence, which has partly contributed to the low case attrition rates. The Committee learnt of a case of defilement of a pupil of Lwanda Primary School in Jinja District by a teacher, whose case file was forwarded to the Resident State Attorney (RSSA) of Jinja for Iegal advice, however, the file was returned to police with instructions that “close and put away, that the complainant together with the victim appeared before the RSSA and withdrew the case against the suspect”. Another case was of a pupil of Kibale Primary School, Rukungiri district, defiled and impregnated by a teacher and matter reported to police and the accused person arrested. However, the state attorney refused to sanction the file on ground that he had received information from the wife of the accused that the accused had previously undergone a vasectomy and was therefore incapable of fathering a child. The State Attorney advised the police to wait for the child to give birth so that a DNA test can be conducted to establish the paternity of the child. “The above cases demonstrate the abuse of prosecutorial discretion which is bestowed upon the Directorate of Public Prosecutions by the Constitution” Rwakoojo said. The Committee observes that there is a need for accountability either by disciplinary action or criminal prosecution of prosecutors who misuse their power and, discretion to discontinue investigations or prosecution without sufficient legal basis and have officers found, culpable for mishandling cases disciplined. The Legislators also called on parents of victims of sexual violence who conceal evidence and collude with perpetrators to defeat the ends of accomplices in crime. Police should, therefore, arrest and prosecute them to deter others from engaging in the practice.